We’ve had some lovely sunny, cold weather here lately, and we were happy to have time on Friday to enjoy it. I’m recovering from some chronic foot problems, and am only allowed short walks on level ground, so we needed something gentle. Birding sounded like a good activity for the day. The winter birds are moving down into the Skagit Valley now, so I went to the BirdWeb site and looked up a few new-to-us sites to check out. First we went to Leque Island, which is between the mainland and Camano Island. 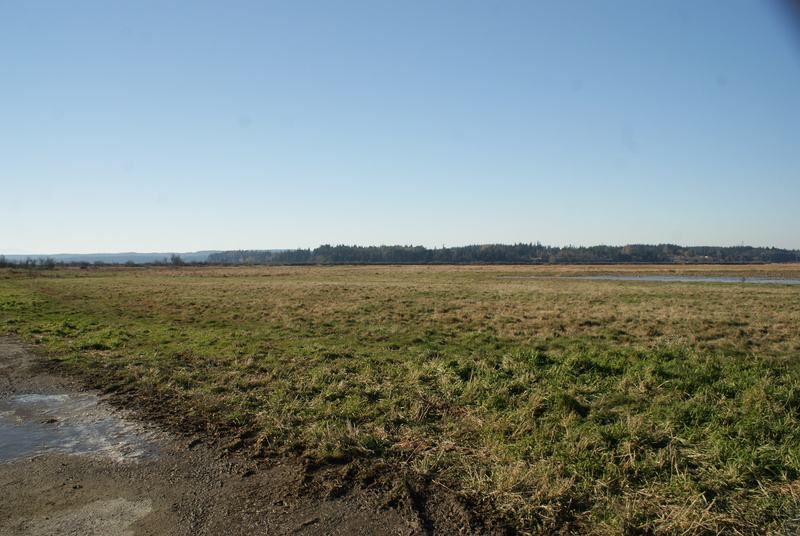 This is a flat wetland and field area that is rich in bird life. According to the BirdWeb site, this area of the Sound supports a large number of wintering waterfowl, songbirds, and the raptors that hunt them. We saw a large hawk in a tree just after we pulled off the road, but it flew off before we got a solid ID. We also saw a ring-necked pheasant in the field before we got to the parking lot. We bundled up at the parking area as we got ready to explore. This area is open to hunting in the winter, and there was a hunter way out in the field to the west, so we went south over the ditch to the slough area to see what we could see. Several Northern Harriers were hunting while we were there, and some different gulls and sparrows flew around (we didn’t take the time to identify them.) 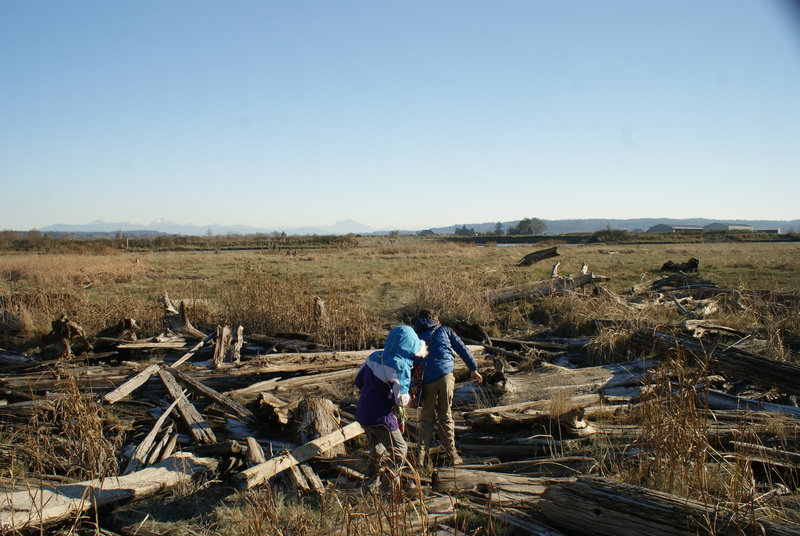 We walked out into the grassy area and got close to the slough, but didn’t see much else around there at that time. Ice crunched under our feet, and we saw bird tracks in the mud next to the water. Another hunter walked nearby at that point, so we decided to head out to another spot where hunting wasn’t allowed. We all agreed this would be a good spot to come back to in the spring after hunting closes. We have never seen as many Harriers as we saw in those fields. If You Go: If you are coming from the freeway, you are not allowed to turn left onto Eide Road from Hwy 532, so you’ll need to go just past the road to a wide spot and turn around. You are also not allowed to make a left turn from Eide Road to Hwy 532 when leaving the island, so we needed to go back into Stanwood and turn around again. There are no restrooms at this parking area, but you do need a Discover Pass to park there. Find directions and more information on Birdweb.org. 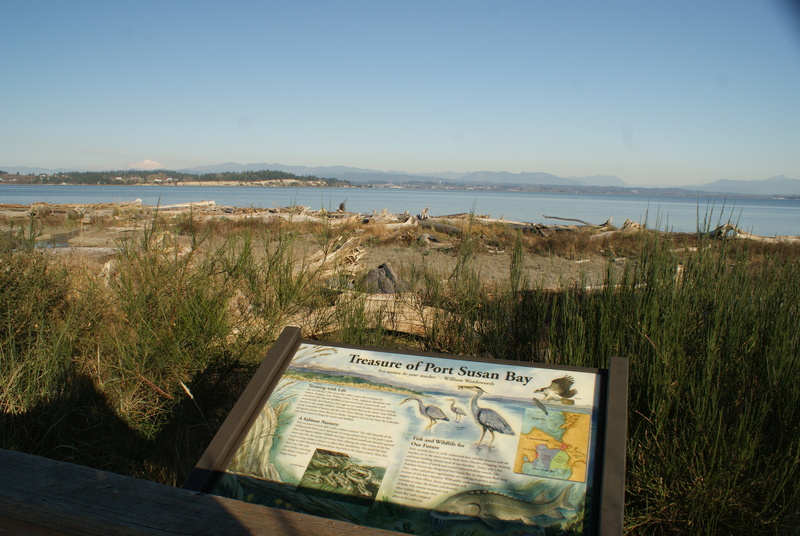 After we were done on Leque Island, we headed over to Camano Island proper and down to a little park called Iverson Spit Preserve. I read about this little gem in a brochure I picked up somewhere about the Great Washington State Birding Trail. These informative maps show multiple birding sites and give driving directions so you can plan an outing with several stops. I never would have known about this sweet park if I hadn’t looked at this map. We parked at the parking area and moseyed out on the trail to the right. It led on a short boardwalk and then out onto the beach. There were some interesting interpretive signs along this portion. We walked out onto the beach, over some driftwood, and enjoyed the fresh air and the birds off in the distance. I don’t have a spotting scope, so we weren’t able to identify the waterfowl out on the bay. 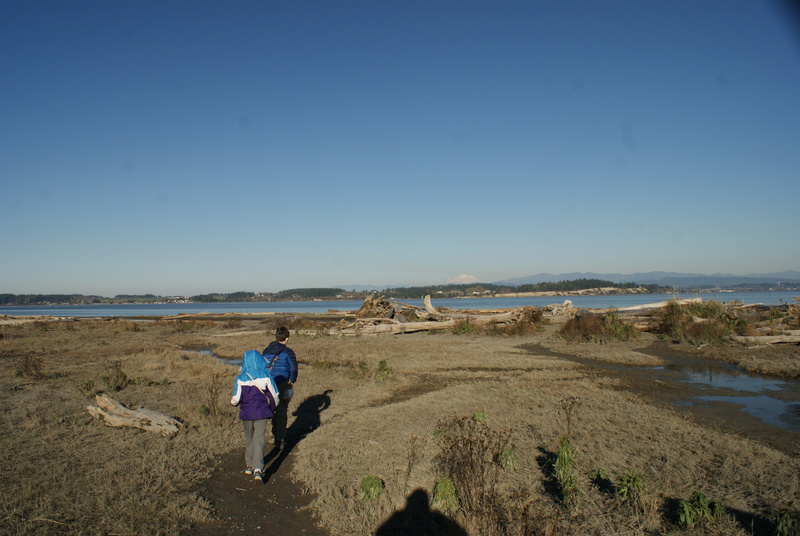 We then walked a little ways out the dike trail, and we could see some trumpeter or tundra swans out in the distance. 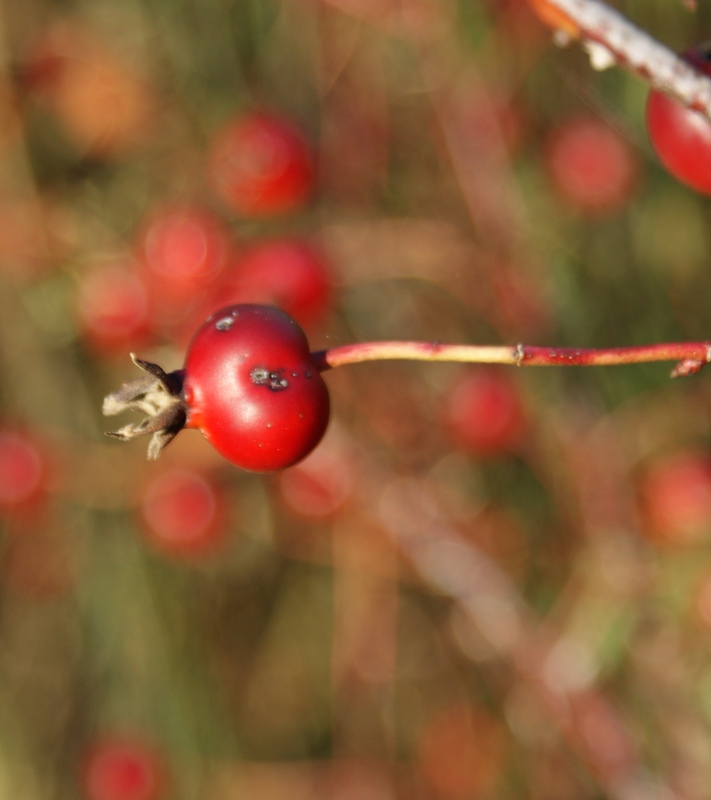 Red rose hips provided brilliant spots of color in the otherwise tawny winter landscape. At this point my feet were getting tired and sore, and I didn’t want to push them any farther, so we turned around and drove back to the little mall area at the entrance to Camano Island. 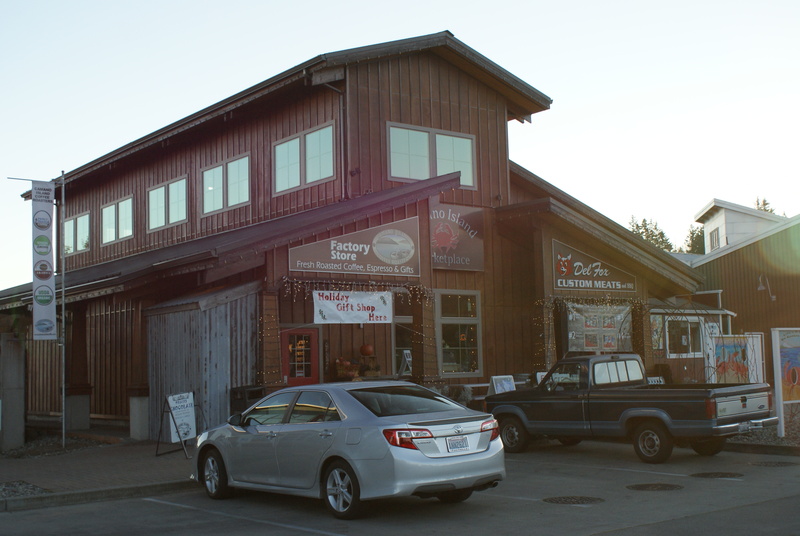 We had some cocoa and cookies at the cafe there, Camano Island Marketplace. They’ve got a friendly barista, a meat market, and lots of handmade art gifts and treasures. If You Go: From I-5 north of Seattle, take Exit 212 for Hwy 532. 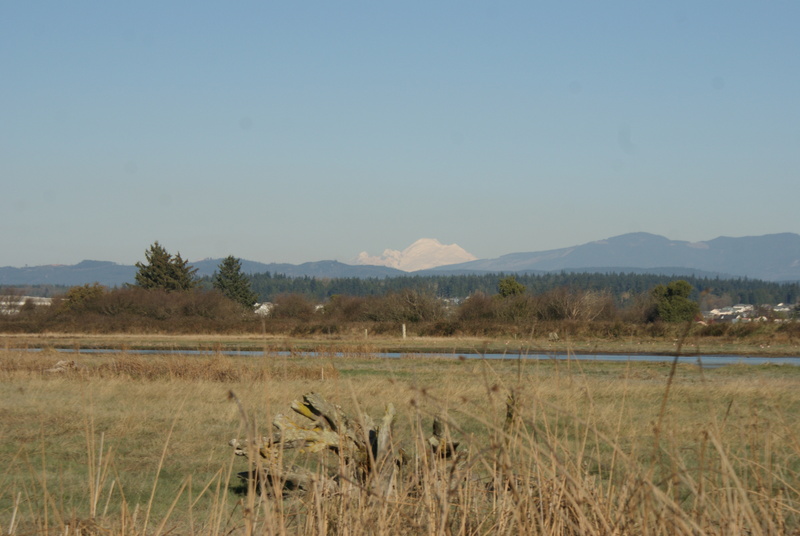 Head west toward Stanwood and cross the bridge over the slough to Camano Island. Stay to the left on East Camano Drive. You’ll reach a junction with stoplights; turn left onto Sunrise Blvd. Drive about 2.5 miles and make a left turn onto Iverson Beach Rd. Turn left at the T, wind down to the lowland, then turn left again and drive to the parking area at the end of the road. There is a porta-potty at the parking area. Dogs are allowed on a leash. Some of the paths are friendly for jogging strollers. For more information, read the Seattle Times article. You can download a free PDF of the Great Washington State Birding Trail map for the Cascade Loop; they also have an app for your phone (I haven’t used this app yet.) You can also find maps for other areas of the state on that site.